In the month of September it seems like everybody is having a birthday. My birthday is in 2 days! Nate’s birthday was a week ago, and our daughter’s birthday was about 3 weeks ago. Then, there’s my mom whose birthday is just 2 days after mine. We have a lot of birthdays this month! Usually we go with the youngest to decide on the party. 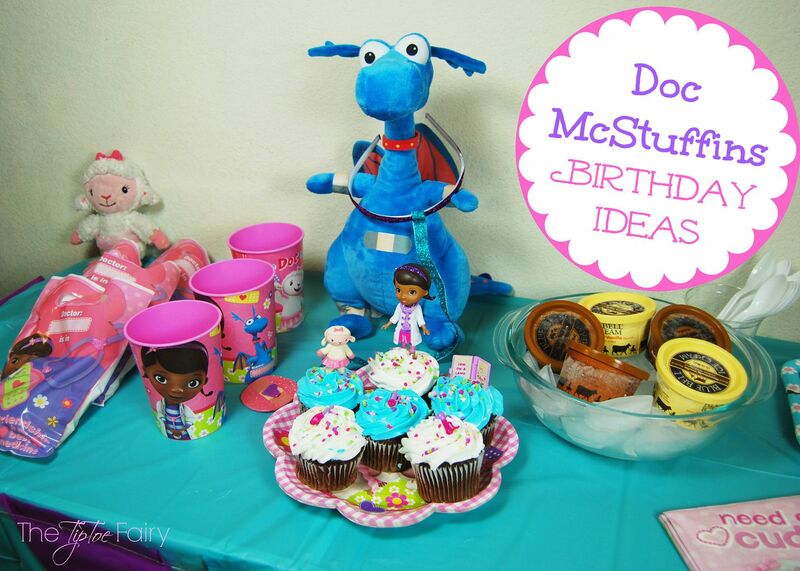 This time around it’s Disney Junior Doc McStuffins, and we have so many Doc McStuffins Birthday Party Ideas to share! After we decided the theme was Doc McStuffins, we headed to Walmart. 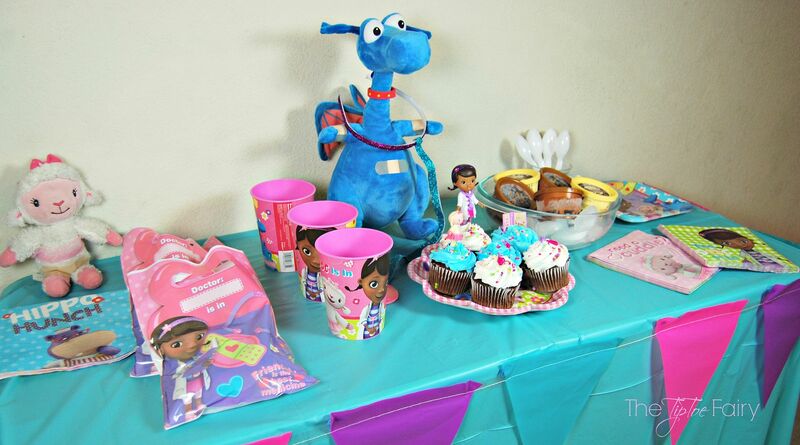 They have a great selection of Disney Junior party supplies from Sophia the First to Doc McStuffins, you can find everything you need for the birthday. We picked up plates, napkins (love that they’re double-sided! ), goodie bags, and those adorable reusable cups. One thing I like to do is buy the small sets of toys to put on cupcakes or a big cake. We just order a cake or cupcakes in the colors to coordinate, and then when it’s time for the party I put the toys on, and voila! We have a Doc McStuffins cake, and she gets to keep the fun toy set. 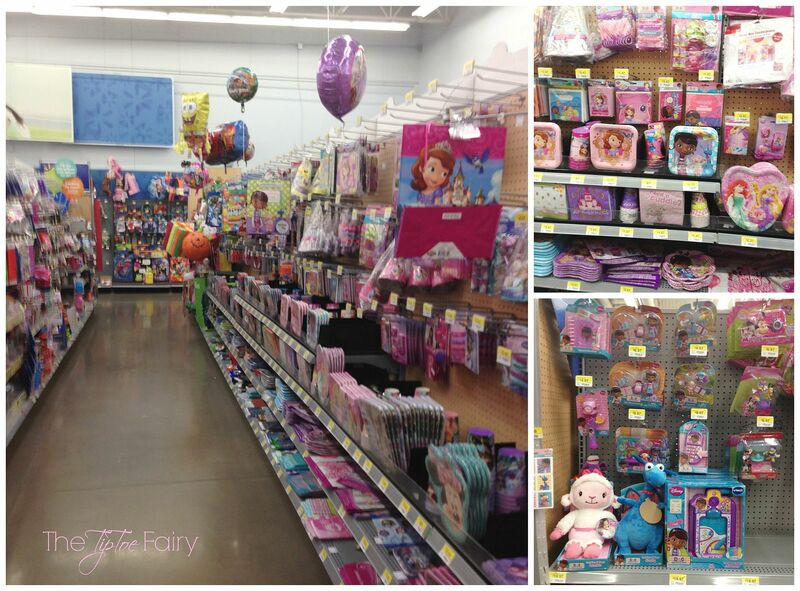 At Walmart you can find several different Doc McStuffins toy sets. We set up a clinic in the teepee complete with tongue depressors (popsicle sticks), bandages, and some gauze, just in case. 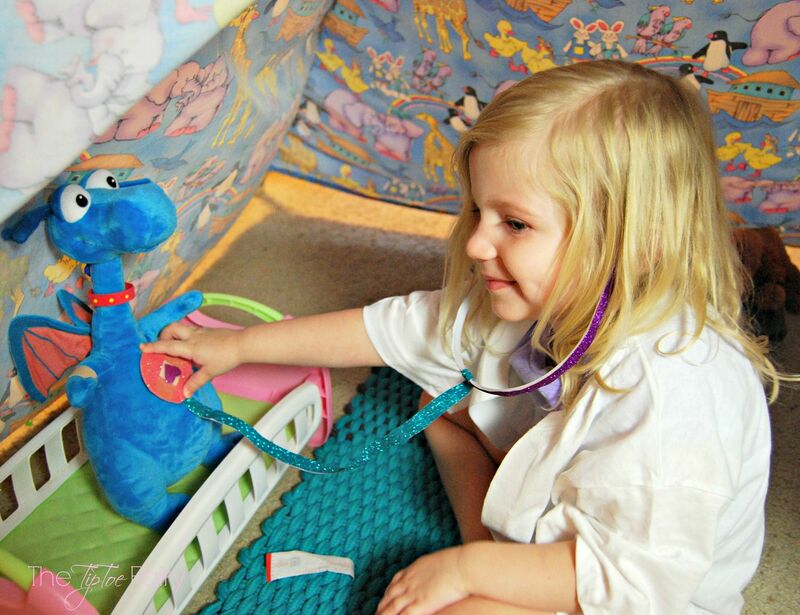 Then, So everyone can be Doc McStuffins at the party, I made up some simple props – Doctor Coats & Stethoscopes! This one is an easy doctor coat out of a white t shirt. For preschoolers, I’ve found Boys size Medium or Large crew undershirts are perfect! You can purchase a roll of Heat n Bond hem tape (regular), and you don’t even have to sew! Just simply cut down the center front of the t-shirt. Then, place the hem tape on the raw edge, fold it over to form a hem, and iron it down. Do this for both sides. Then, cut 2-3 small circles of fleece and attached them with the same iron-on hem tape for “buttons” to the lower part of the doctor coat. 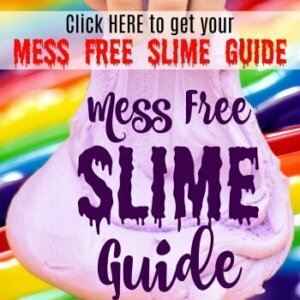 You can whip out several of these in no time as a take along gift! The next fun prop is making stethoscopes for everyone to take home! I found this amazing glitter tape over in the teacher supplies area. Using a plastic headband, I covered the top with purple glitter tape. Then, I took a 24-inch long piece of turquoise glitter tape and folded it in half and stuck it to itself. I left a loop open to insert the headband. Then once it was in the middle of the headband, I sealed it shut. Stick the end of the turquoise piece int the middle of one of the circles. Then, put the two circles together. Next, embellish with a bandage and the heart. 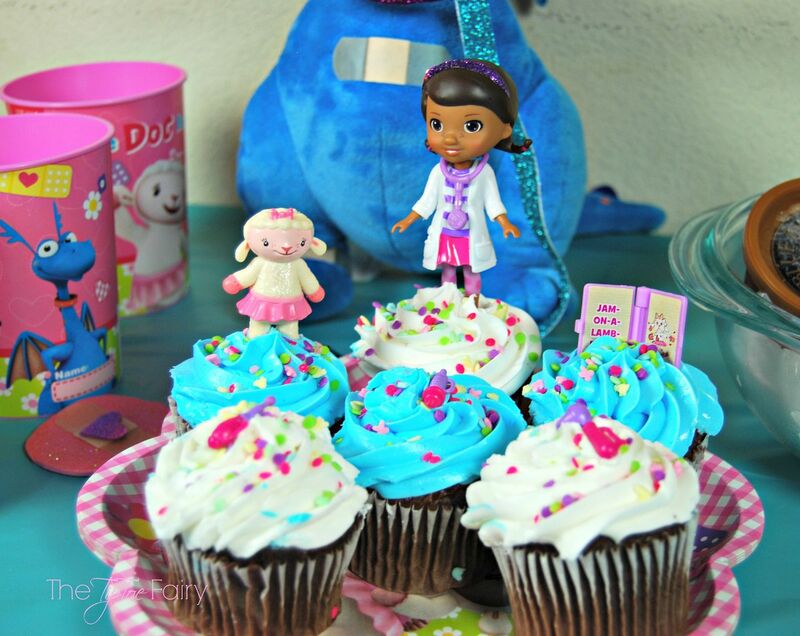 We finished off our decorating with some fun new Doc McStuffins toys. Molly was dying for a talking Stuffy doll. I decided he would make a great centerpiece for our fun party — of course, it was after he had been to visit the clinic! What fun party ideas do you do for your little ones? Great ideas! 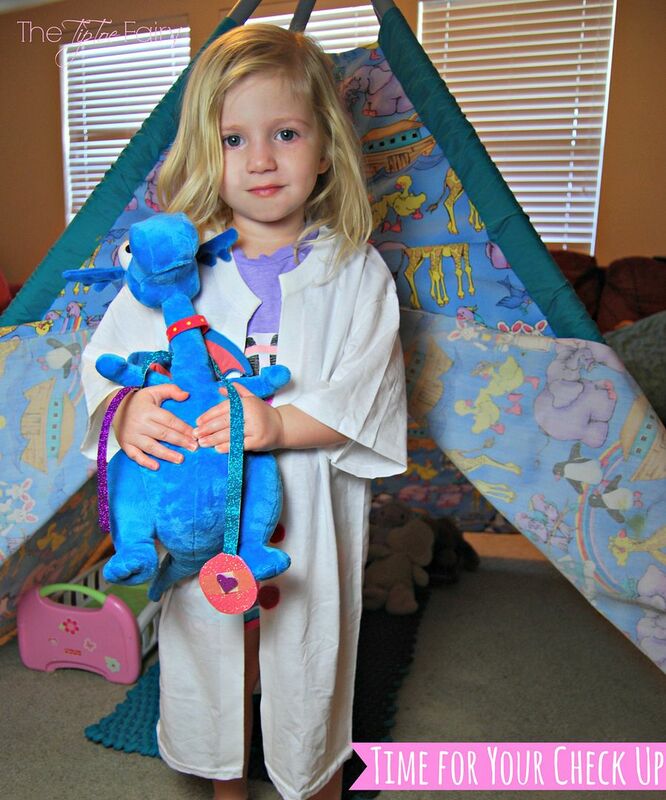 I love the DIY doctor coat! Awesome ideas!! I’m going to be doing my duaghters in Doc Mcstuffins as well & I am going to take those Vanilla Sugar Wafer cookies & some pink icing & pipe some pink hearts in the middle to make band-aids!